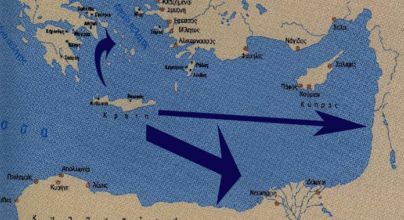 Crete is well placed for communication within the Mediterranean and clearly had connections with Egypt. A statuette from the twelfth dynasty (about 1990 B.C.) was found at Knossos; this is an image of one User, who may have been an official representative or ambassador to the Cretan court. In Egypt, on the walls of the tomb of Senenmut, the vizier of Hatshepsut, are paintings of foreigners bringing in goods. Among them are men in obviously Cretan costume carrying Cretan pottery, perhaps items of trade or even tribute, during the 1500s. The palace officials were in charge of commercial activities and kept archives of clay tablets, bars and disks with Hieroglyphic or Linear A script. The Minoans, called Keftiu or people of the Islands 'In the middle of the great green sea' by the Egyptians, were portrayed bearing precious gifts to the Pharaohs, a visual testimony to the close commercial relations between Crete and Egypt, in the graves of Egyptian high officials. Minoan Influence on Cycladic material culture (architecture end pottery) and artistic endeavours (wall-paintings) was very strong. The Minoan civilization's radiance was even broader, as shown by fragments of Minoan wall-paintings found in Egypt, Syria and Palestine.